It's an ordinary Sunday evening in New York City. The close of New Year's Day and I've just said to my husband, "We've had a really lovely day." 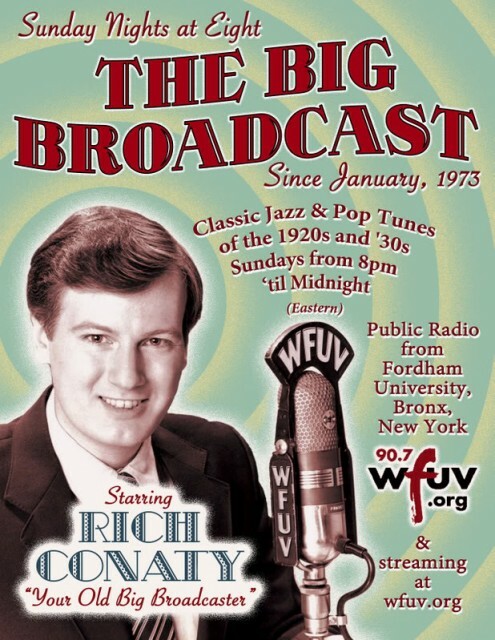 We start making dinner and I put on the radio to WFUV FM to listen to Rich Conaty and his creation, The Big Broadcast", just like we've done nearly every Sunday night for the past twenty years. What might be called 'old' music fills the room--scratchy 78's of Scrappy Lambert, Jelly Roll Morton, Vince Giordano and the Nighthawks, and Louis Armstrong when he was very young. Suddenly, an abrupt pause and a serious female voice fills the room to say that Rich has died. My husband and I freeze in the kitchen. All dinner preparation stops. I bump up the sound to see if we can hear anything else, anything to explain why. But there's none. Announcement over, there's nothing left to say. Death halts everything. Yet Rich Conaty resumes talking for the next three hours in what must have been a show he pre-taped up there in the Bronx at Fordham, the Jesuit University. In that way we humans try to make order out of the disorder death brings, Geoffrey and I start telling each other things Conaty revealed on-air during 2016. He'd been ill. He'd had an operation. After the operation he sounded weak, very weak. We worried. How could we not? He didn't sound the same, and because he was a part of this house, we felt it severely. We recall "Manhattan Mary," his only wife for a short time. She had died, too. Who was she? Also his mother, "Mother Conaty" as he called her, down in Florida. Didn't Rich talk about visiting her only a week ago? He must have had an inkling of his own mortality. I shut the radio off. Our little apartment in the Village is stunned into silence. Still Geoffrey and I proceed to make dinner. It's only a radio show. Yet, radio is the most intimate of home entertainment. It's right there in the room with me, following me around the apartment. Funny thing, until last night I didn't know that Conaty and I were both raised in Astoria, children of Irish immigrants. Very likely we both fell in love there with radio, when the "Make Believe Ballroom" ruled the afternoon airways, making ordinary life seem glamorous. Everything I know about music comes from the scattershot nature of radio and its DJ's. Through the magic of invisible DJ's like Martin Block, Jim Lowe, and William B. Williams, I was introduced to musical tastes I took on as my own. I did the same with Conaty and his wildly eclectic array of music from the 20's and 30's. One of Conaty's favorite singers, Annette Henshaw, would sign off each song saying, "That's all." And it is. It's over. Even if WFUV repeats the hundreds of "Big Broadcast" shows, it will never be the same. Better than nothing at all. But it won't have Rich Conaty up there in the Bronx, with his superb, quirky taste and his complicated view of life guiding us all into a New Year. I shut the radio off as Conaty is spinning 1928's "Garden In the Rain"
And sent us happily on our way." Rich Conaty always did just that.